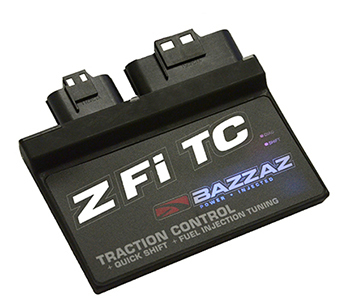 The Z-Fi TC™ provides adjustable traction control along with fuel control and quick shift all in one box. The Z-Fi TC™ offers up traction control technology derived from the highest levels of professional racing anyone desiring the ultimate in technology, pure fun, and advantage over the competition. The Z-Fi TC™ does not require any additional sensors to be mounted to the bike. Countless hours of Superbike testing were used to distill the complicated nature of this technology into a simple and intuitive tuning interface using the Z-Fi™ software. Traction control is easily adjusted by Throttle Position, RPM, and Gear to suit any track, riding condition and riding style. Currently the Z-Fi TC™ system is run by top Superbike teams around the world. Traction control is legal in most racing series; check your rule book before racing. Adjustments can be made 'on the fly' with an optional TC adjust switch, making tuning even more simple.